What is the most popular casino game nowadays? There can be many answers, as there are different tastes, but without a doubt blackjack card game is one of the most famous and widely played in casinos all over the world. 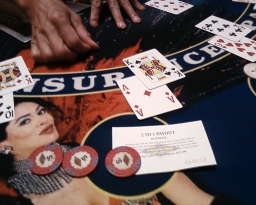 The game originated in the 17th century and during the history of blackjack many variations of this game of skill appeared. Skilled and professional players know and understand the difference between such variants as Spanish 21, Vegas Strip, Blackjack Switch, Perfect Pairs and European Blackjack. The latter gained popularity due to easy and understanding rules. The main idea of the European Blackjack is the same as in traditional blackjack and it is to get as closer to 21 points as possible. Players are playing against the dealer, no matter how many players are sitting at the blackjack table. The value of the cards in the European variant of blackjack remains the same: Ace is counted as 11 or 1 (depending on the hand), all face cards are counted as 10 and the small cards are counted according to the numbers written on the cards, e.g. 7 is counted as 7. Players are allowed to hit up to nine times to have 11 cards in total. Players should keep in mind that knowing the rules can help them when playing but this will not guarantee the winning as there are different strategies for blackjack that can increase the chances for winning.